The Bullmastiff is a working dog bred to deter and track down poachers. It is a cross between the large Mastiff and the tenacious Bulldog. Bullmastiffs are smart, fast and obedient, which make them perfect guard dogs. It is a quiet watchdog that barks only when necessary. It's intimidating appearance and size is a deterrent to people with ill-intentions. The Bullmastiff weighs 100 to 120 pounds and stands at 61 to 69 centimetres at the withers. Its short coat that clings to its skin makes it easy to groom. Bullmastiffs are not high-energy dogs and adapt well enough to any environment. 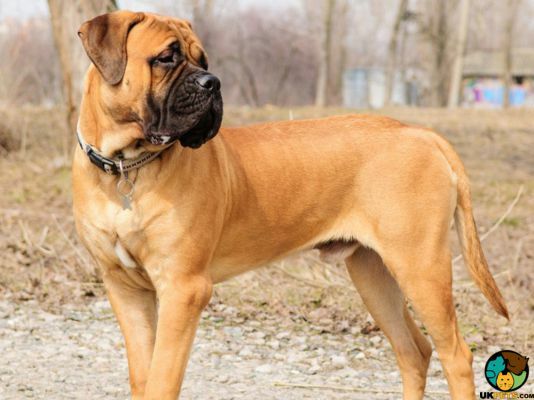 Are you looking for an excellent guard dog like the Bullmastiff? Here is a brief background to help you decide. The Bullmastiff is a modern breed originating in Britain in the mid-1800s. They were bred as working dogs developed primarily to deter poachers off estates. Known as the Gamekeeper's Night Dog, the Bullmastiffs worked alongside the English estate gamekeeper and his family. Bullmastiffs came about when gamekeepers crossed the large and strong Mastiff with the fearless and aggressive Bulldog to develop a breed with the right strength, speed and size to fit the role. The 20th century saw a decline in the poaching, so Bullmastiffs were put to work for different purposes as sentries and guards alongside the police and military. In 1924, the Bullmastiff was recognised as a breed by England's The Kennel Club. The same year, the British Bullmastiff League was founded, which established the first official breed standard. The Bullmastiff is a large muscular dog that weighs 100 to 120 pounds and stands at 61 to 69 centimetres tall at the withers. Bullmastiffs are bred for strength, endurance and speed. They have broad, square heads, wrinkled faces, a very pronounced stop with dark short muzzles, and a slightly undershot bite. Ears are V-shaped that are a little darker in colour than the rest of the body. 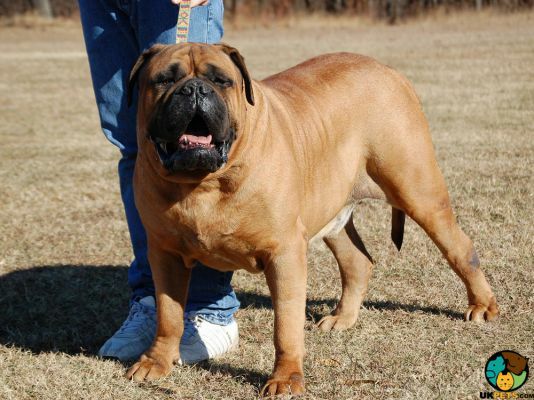 The Bullmastiff has a broad chest and a thick and muscular brisket and sloping powerful shoulders. Their tails are set high on the body and taper slightly to the tip reaching the dog's hocks. 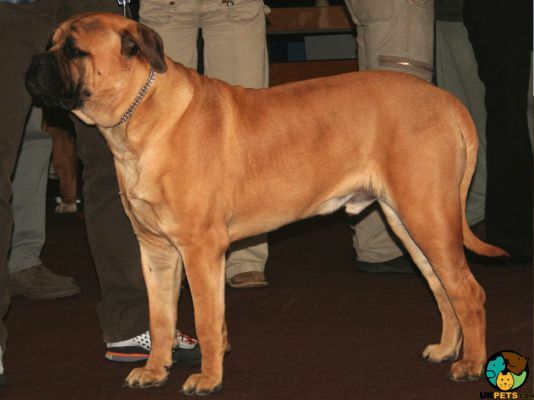 The Bullmastiff wears a short coat that may appear as fawn, red or brindle, the accepted breed colours for The Kennel Club registrations. Coats should have no white markings except a little on the chest. The coats are short and extremely weather-resistant, which should be easy to groom. This means a weekly grooming using a mitt will suffice to keep the dead hair off and maintain its coat looking healthy and clean. It is crucial to keep an eye on Bullmastiff's face, and muzzle as the folds may cause potential skin issues. Include the creases in your grooming to prevent any bacteria from thriving and causing infections. The rest is basic care such as regular brushing of the teeth, nail trimming and ear checks. Bullmastiffs are impressive-looking dogs that are remarkably loyal and obedient to their owners. 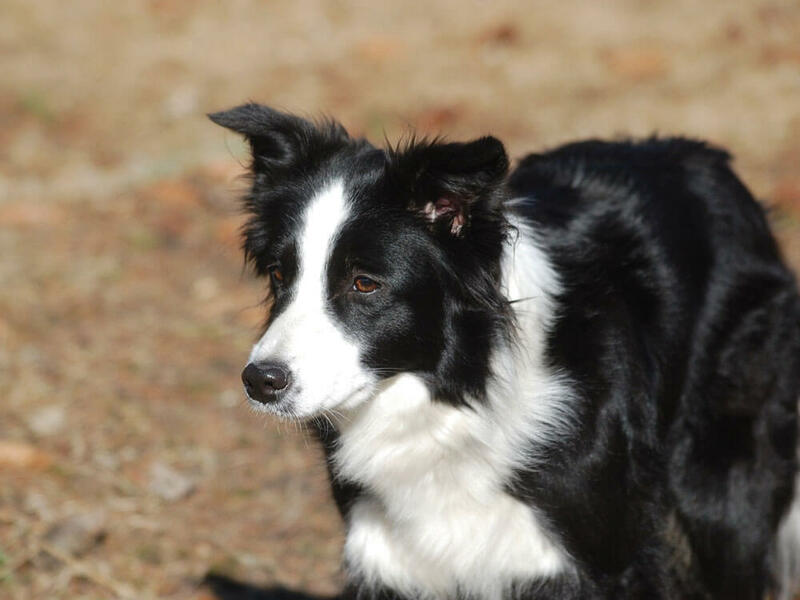 It is a smart dog breed that tends to think for itself but also has an eager-to-please personality. The Bullmastiff forms strong ties with their families and may suffer from separation anxiety if left alone for longer periods of time. Bred as a watch/guard dog, its protective nature allows it to respond quickly to any threats to its family. It is wary around people outside the family circle but will generally tolerate being around strangers that are introduced to them by its owners. 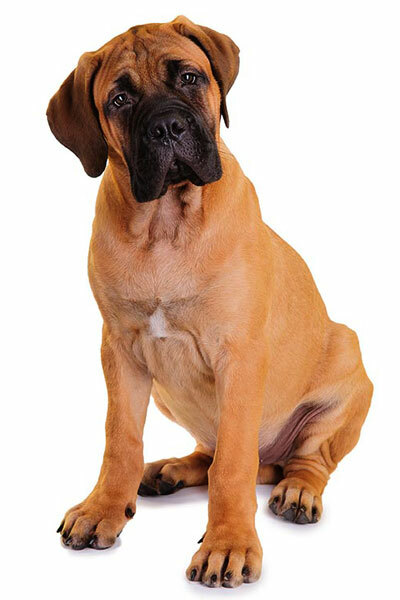 The Bullmastiff dog breed is not ideal for first-time owners as it tends to show its dominant nature in the household if not properly trained to know its place in the pack. It needs experienced handlers who can establish authority and can give it the right training from an early age. Bullmastiffs are not ideal for families with small children since this dog is not as tolerant of children as other dog breeds. Anyone who already has a Bullmastiff and children at home must make sure interaction (e.g. playtime) is supervised, as with any other dog breed. A typical serving of an adult Bullmastiff is 4 to 5 cups of high-quality dog food daily. Keep in mind that each dog is going to be slightly different with some requiring more calories than others. Bullmastiffs need healthy amounts of lean protein to keep them lean. They also need a gluten-free diet for better digestion and avoid conditions like bloat. To keep its coat healthy and shiny don't forget omega 3 fatty acids in their diet. Fruits and vegetables are also super important for its overall health. Bullmastiffs are healthy dogs but, like any dog, are also predisposed to certain health conditions. These include Hip and Elbow Dysplasia, Hypothyroidism, Entropion, Subaortic Stenosis, Cystinuria, Bloat or Gastric Dilatation Volvulus, Panosteitis and Allergies. Bullmastiffs need at least 1 to 2 hours of exercise daily such as long walks or a romp around a securely fenced yard. Avoid taking your Bullmastiff outdoor when it's hot. This dog breed has a short muzzle that makes them prone to exhaustion and heatstroke. The thought of owning a Bullmastiff may be rewarding but there are certain adjustments that you have to make. Other than making more room for one more family member, you also have to set aside an additional budget to raise it. 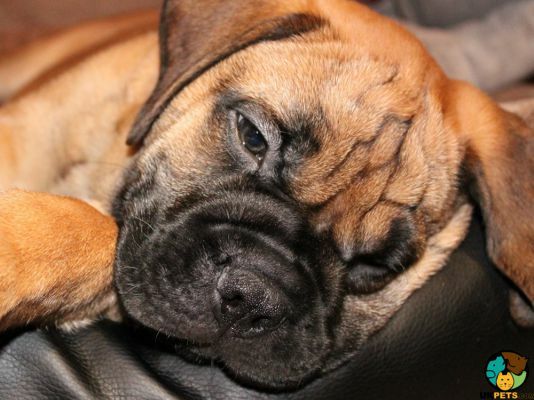 Bullmastiffs will cost around £800 to £1,000 for a well-bred puppy from a reputable breeder. Let's not forget pet insurance. 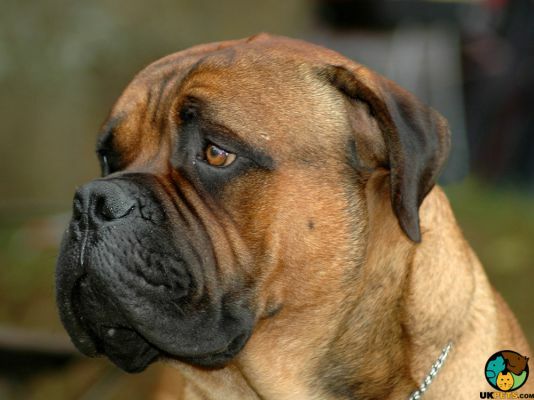 The cost to insure a Bullmastiff may be around £62 a month for a basic cover and £116 a month for a lifetime policy. Veterinary costs is another thing that will quickly set you back £1,400 a year. These include initial vaccinations, boosters, and neutering and routine veterinary health checks. Other costs to factor in are the purchase of dog supplies and equipment which includes the leash, collar, food bowl, toys and bed. This will roughly be around £100 to £200 depending on the quality you choose. Overall, you may need to shell out £120 to £200 a month. Is a Bullmastif Right for You? Bullmastiffs are loyal, protective and are natural guard dogs. They only bark to alert or when necessary. They are ideal for owners who are experienced in training dogs. They are also not the best choice for families with small children. They are considered as an expensive dog breed. Their exercise needs are not that demanding.